Anshe Chesed has so much to offer our members and guests of all ages! We are incredibly proud of our Youth Program, which is centered around offering quality, age-appropriate Shabbos/Yom Tov Groups throughout the year. On Shabbos and Yom Tov, we offer Groups for children ages 6 months-Bar/Bat Mitzvah, starting when davening does, at 9:00 AM. Groups has two functions: As in many places, it is a safe environment for monitoring children while their parents daven. Each Group is supervised by two non-Jewish staff members hired in the role of "camp counselor" in both entertainment and childcare capacities. Then in addition, children in Pre-K through Grade 5 are taught davening and parasha by teachers in the community (see below for a schedule)! Aside from davening, our Youth Program is filled with weekly learning opportunities during the Winter months! From November through February, Rabbi Hess holds a Parent-Child Learning program for children in grades Pre-K and up. This program occurs on Shabbos between Mincha and Maariv, followed by a light dinner of pasta or hot dogs right after Shabbos ends. 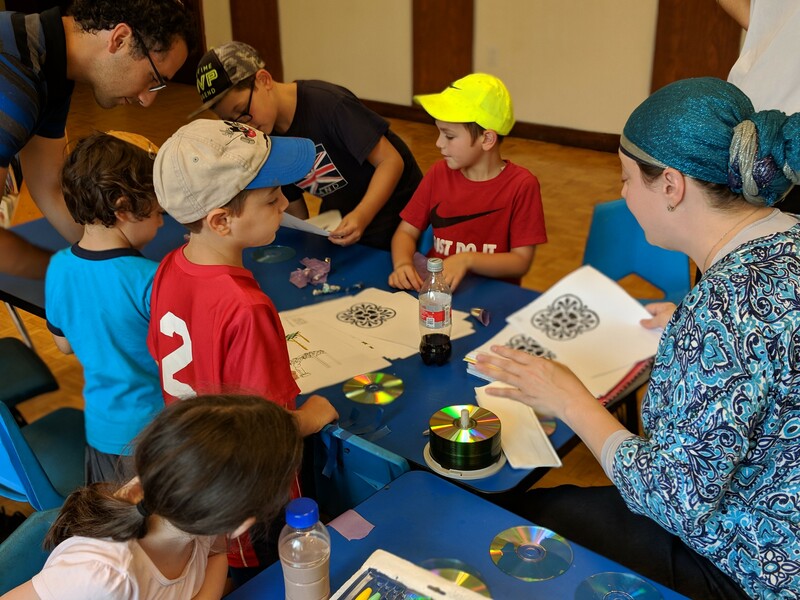 For grades 5 and up, the program features Mishnah study led by Rabbi Hess, and for grades 4 and under, it includes parent-led parashah learning with guides developed by Rabbi and Naava Hess. Further, we have annual holiday activities for children and families. These have included pre-Rosh Hashanah apple picking, Sukkah building and decorating, a Sukkah Hop, Thanksgiving pie deliveries to the Linden fire and police departments, a Chanukah toy drive, a Purim book drive, a Pesach Chocolate Seder, and Shavuot Learning in the Park. Speaking of the park, the Linden community has many parks/playgrounds owned by the city and public school district. One of them has become our Anshe Chesed Shabbos Park! All children are invited to join us at the Shabbos Park around 4:30 PM, with their parents, every Shabbat in the summer to relax, have fun, and be a part of the community. Group 1: Infants and Toddlers, ages 6 months – 2years - Interactive playing and snacks for our youngest members. Group 3: Pre-School, Nursery-Pre-K, Kindergarten - Supervised and interactive play, story time, and snack. Age-appropriate davening & parashah learning, for about 10-15 minutes, are with one of our community's teachers or high school students - This group joins the congregation in the sanctuary for Anim Zemirot. Group 4: 1st & 2nd grade - Supervised and interactive play, story time, and snack. Age-appropriate davening & parashah learning, for about 15- 20 minutes, are with one of our community's teachers or high school students - This group joins the congregation in the sanctuary for Anim Zemirot. Group 5: Elementary Students, Grades 3-5 - Supervised developmentally appropriate board and card games, snack, and opportunity for independent reading. This group begins a 20-30-minute Junior Congregation with davening, learning, and weekly reflections in the Chapel with one of our community's teachers. This group joins the congregation in the sanctuary for Aleinu. Group 6: Grade 6-Bar/Bat Mitzvah - Shacharit and Mussaf davening are in the main sanctuary. During leining, Haftarah, and the Rabbi's speech, these children have supervised developmentally appropriate board and card games, snack, and opportunity for independent reading.